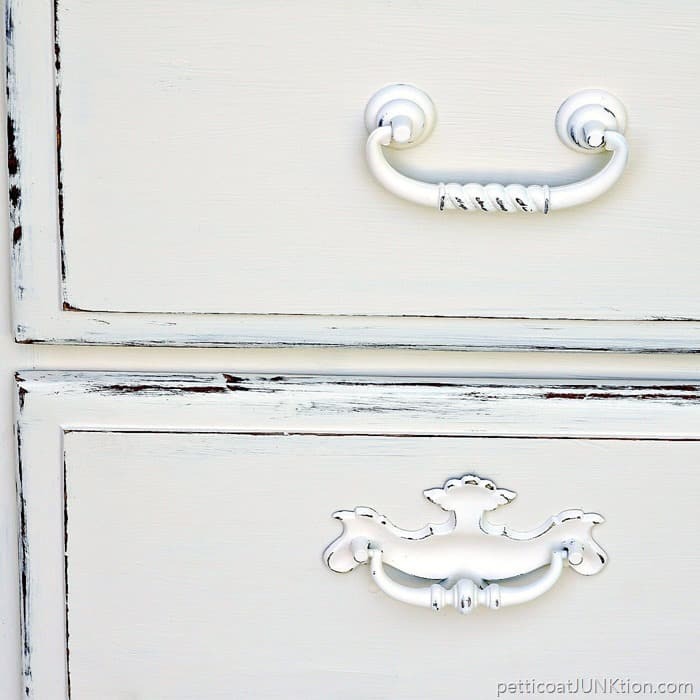 If you like white distressed paint this post is for you. I know I’m all about bringing color into my world but sometimes I see a piece of furniture that screams for the simplicity of white paint. This piece was one of them. Even the hardware wanted to be white. 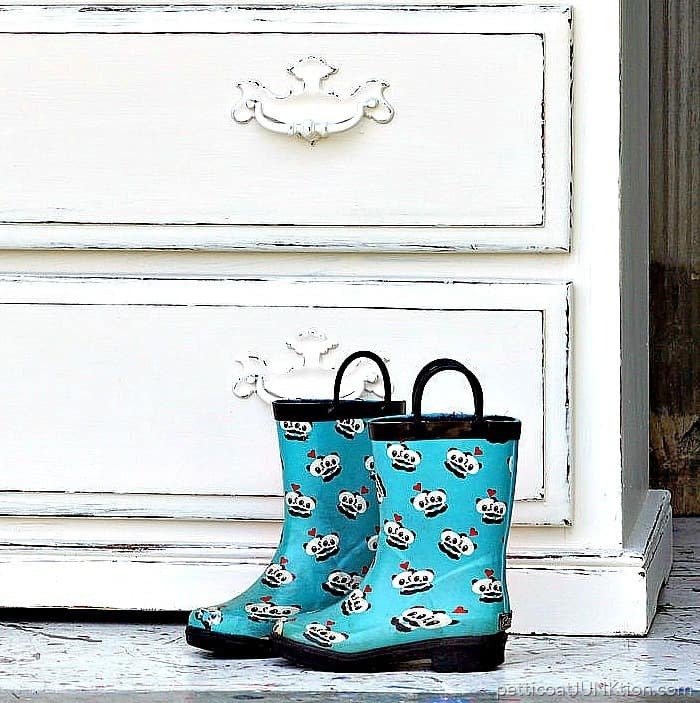 Aren’t those rain boots cute. I was standing in line at the local thrift store when I spotted them on a shelf by the cashier. I picked them up and almost put them back. The price was $3.89. Kind of high for the thrift store. But I do get a discount (golden oldie). So I bought them. I bought the chest at my favorite junk shop. I believe it was $30. 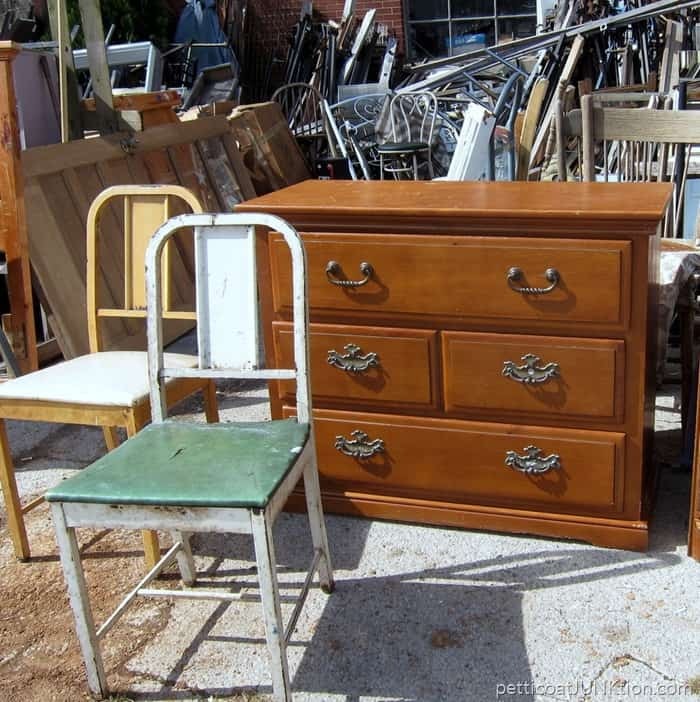 Just looking at the chest makes me think it belongs in a nursery. Perfect size and low enough to use as a diaper changing station. The first thing I did was try to remove the drawers. I couldn’t get them out. The JTS and I pulled and pulled on them every way we could think of but they wouldn’t come out. Well, that works for me, painting with the drawers in place. I applied a coat of Glidden Gripper Primer tinted gray. It’s not easy painting furniture with the drawers in place. After priming I painted the chest with some white paint I had on hand. I was distressing the drawers when I noticed something interesting. Take a look at the before photo above. The drawer in the middle has divided panels. Now we all know that drawer should go in the top slot. I pulled the middle drawer and it came out easily. ???? 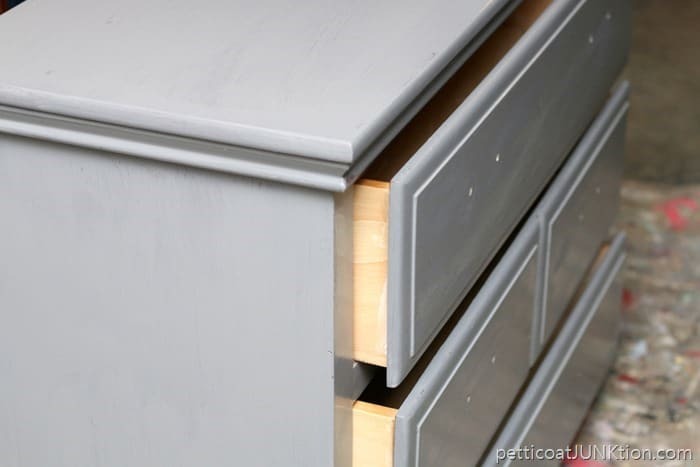 The chest has these plastic flaps on each end of the drawer slots. That’s why we couldn’t get the drawers out. I called the JTS and he helped me get the other drawers out. We did have to work on them for a bit but they eventually came out. I used 100 grit sand paper and distressed the white paint by hand. It takes a little longer to distress the paint by hand but I have more control than with an electric sander. 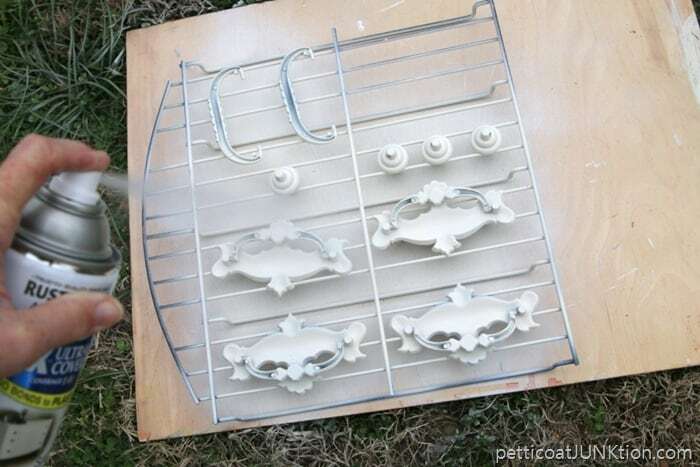 The hardware has a coat of RustOleum Spray Paint in Heirloom White (one of my favs). The color is off white but looks white until you put it up against something that is really white. A little distressing for the hardware too. This part takes just a few seconds per drawer pull. Painting furniture doesn’t take long it’s the prep work that takes the biggest amount of time. Do you think I made the right call on the paint? If you like white furniture you will love the bench I painted white and stenciled. See it here…..Farmhouse Style Bench. I’ll be here tomorrow with the Furniture Fixer Upper girls. My project for the tour is a stunner if I do say so myself. Patting myself on the back. I’ll see you tomorrow. Have a great day! p. s. Someone asked about my favorite paint sprayer. Here is the Amazon affiliate link to the HomeRight Finish Max Paint Sprayer. (affiliate disclosure here) I love it…..
Wow! Love this. White is the perfect color and the distressing looks great. If I lived closer I’d come and grab this! Wow, what a transformation! You made the right call on going white but I love anything distressed white. 🙂 Thanks for sharing this with us at Merry Monday this week! So pretty! 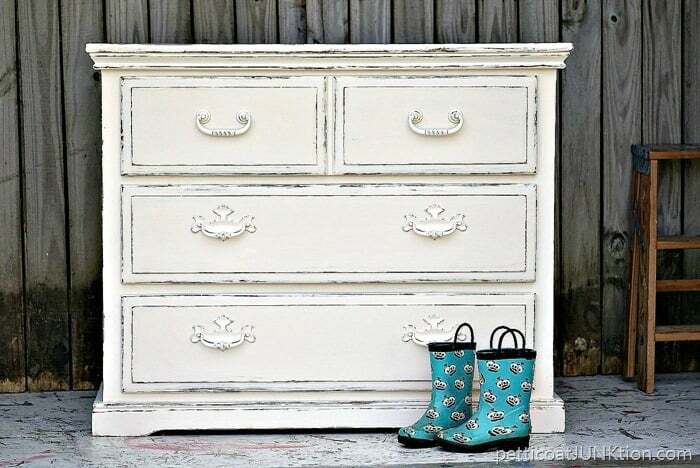 Distressed white is probably my all time favorite for furniture! I think you made the perfect call. 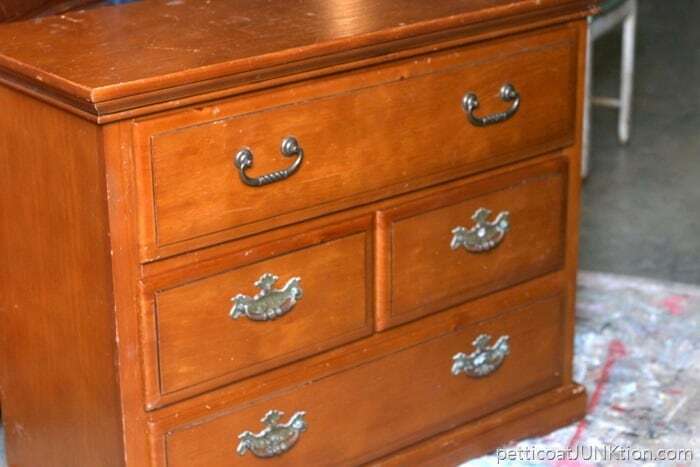 That little dresser painted white is perfect. I agree with you that it would be so cute in a nursery. 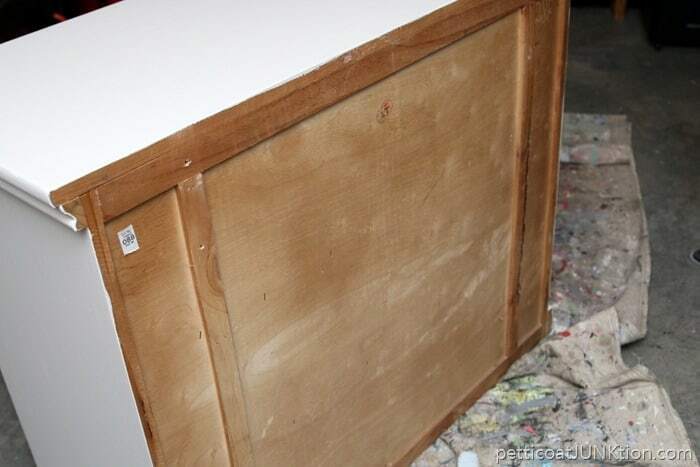 I have a chest of drawers that could do with with distressed white. I’m not brave enough to tackle it by myself though. You definitely made the right call with the white paint! I especially like the painted hardware. Perfect. Completely agree white was the perfect choice, it’s a lovely chest now. And the boots- Cute! Why did you use the Glidden Gripper Primer? 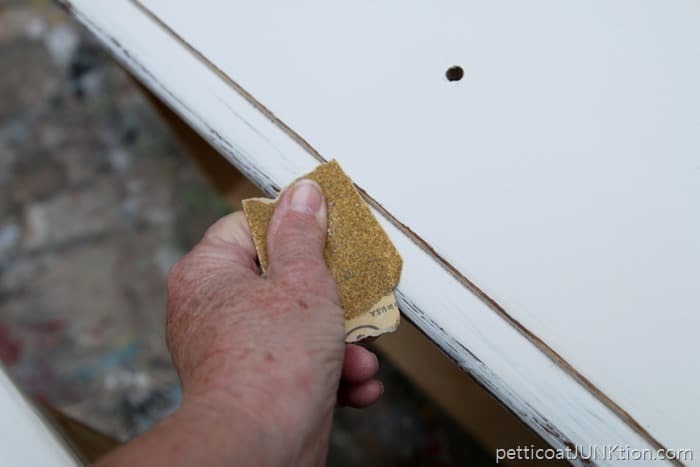 I use chalk paint and milk paint all of the time and have never used a primer. Just curios. 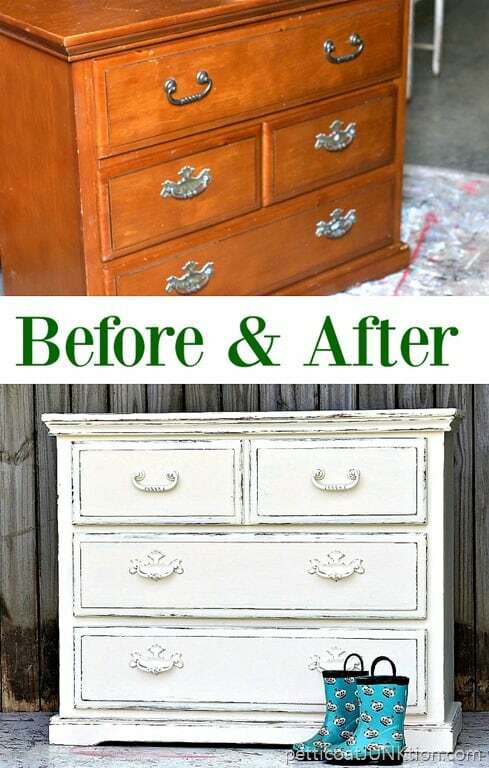 Love the dresser and the white is perfect!! You are so clever! I love this chest of drawers. 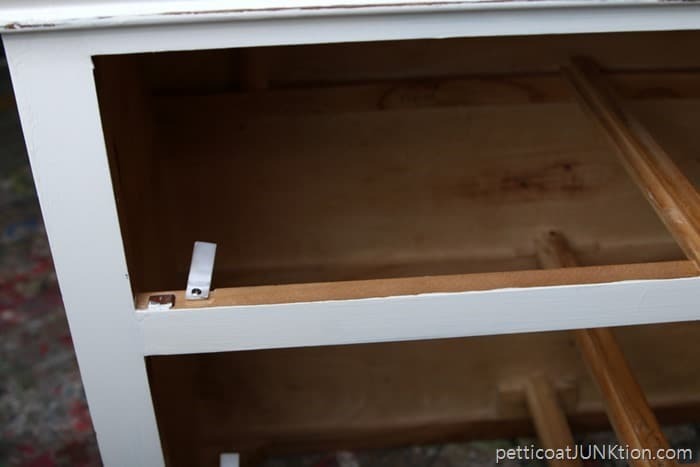 I have had the same problem with getting drawers out and also learned to feel around them, underneath, along the sides, and behind them to see if someone has come up with a “clever” idea to keep them from opening too far. I’ve never seen this one before though!! Same here Pam. We tried everything you said and couldn’t see the problem. Just accidentally when I pulled the middle drawer it came out. On one side the little do-hickey was missing. I guess that helped. Looks really great. I love it! Oh yes, the white looks soooooooooo much better. I like the painted hardware too. You certainly made the right choice, at least I think so!! So pretty. 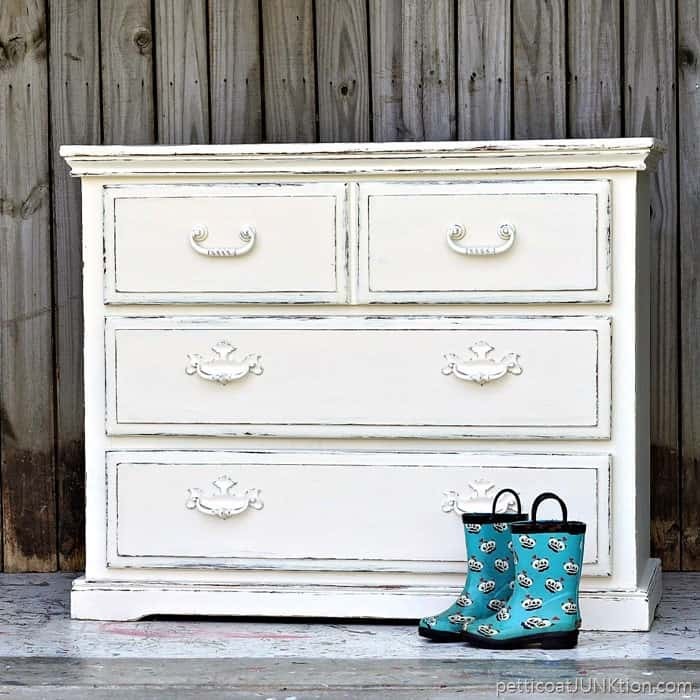 Love the boots and the dresser is gorgeous! TFS! A perfect paint choice and beautiful results! The white is a great choice! Absolutely perfect. Love it! This piece has inspired me to do some painting!